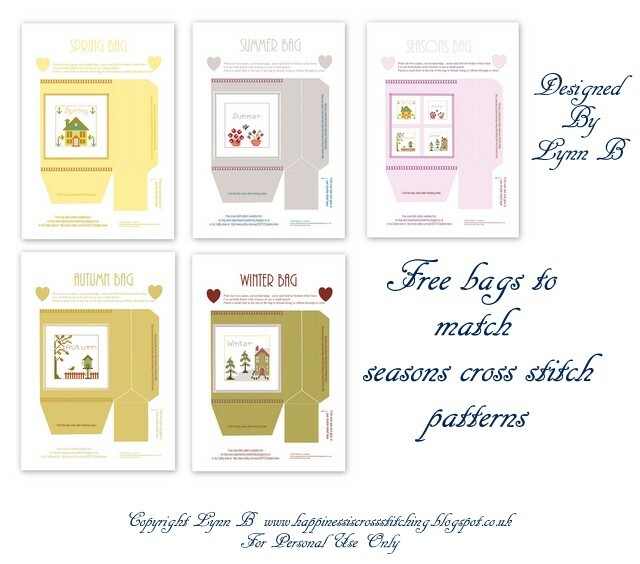 Freebie Friday - Pattern image for this stitchery. 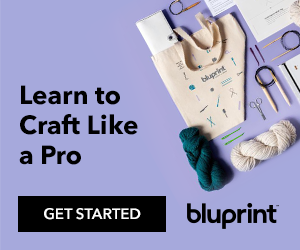 Free pattern image for the above design. My craft room revealed and a British Craft Award 2013! Hi everyone, I finally managed to finish off the paint touch ups after the fitter had finished the craft room, this is just one side, the other needs paint touch ups and tidying before I can show you, but I am getting there! 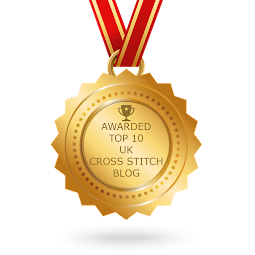 I loooove it, to be able to leave my stitching out and not have to clear away my sewing machine from the kitchen table is a real bonus, I feel totally spolit! Hi everyone, you may have noticed that I have changed my blog slightly, you now need to click on the "read more button", I really did not want to do this but I was forced to because my blog has been scraped, i.e. copied and placed on other web pages. 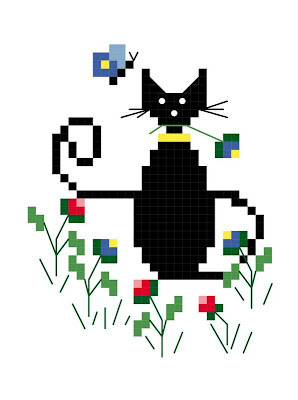 Hi everyone, here is the new Summer Cat cross stitch pattern from my mini cat series, just click on the pattern below, right click and "save as" to your computer. Quilted needlebook, pinkeep and strawberry, also winner of giveaway announced. Hi everyone, I finally managed to get some stitching done in my craft room and here is what I have been making, a quilted needlebook, matching pinkeep and felt strawberry. 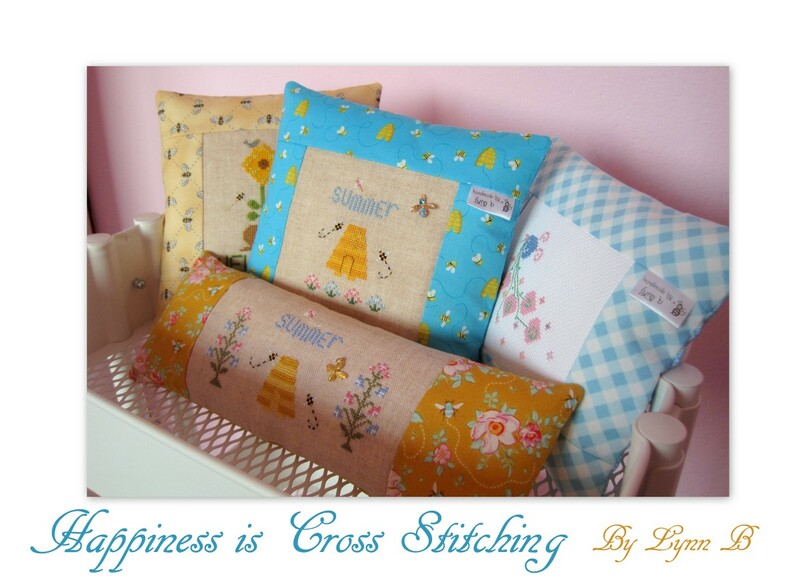 I designed the pattern based on the cross stitch sewing machine pattern I designed a while ago. I stitched it on white fabric and then chose this wine coloured fabric with cream polka dots but then realised I should have stitched the design onto cream fabric, but hey, never mind it will just have to do! Here is my latest freebie for you, a lace bookmark in various colours, I used Photoshop 11 to design these using a free lace photoshop brush from http://www.obsidiandawn.com/ and incorporated it into the design to make these pretty bookmarks trimmed with ribbon. 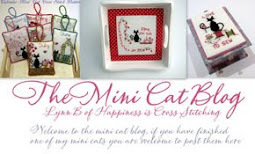 The bookmarks are available below this post. Small Marie Antoinette giveaway, work in progress and gifts from my sister. Hi everyone, apologies for the delay since my last post, I have been very busy helping my husband landscape the front garden, I have found muscles I did not know I had! We decided to remove a small picket fence and replace it with a pretty hedge, it looks much nicer now but obviously I had no time to spend in my craft room.